The UN is to choose a new envoy to Yemen after Jamal Benomar resigned amid criticism from Saudi Arabia. Civilian suffering is mounting in the country, with hundreds killed and tens of thousands fleeing for their lives. 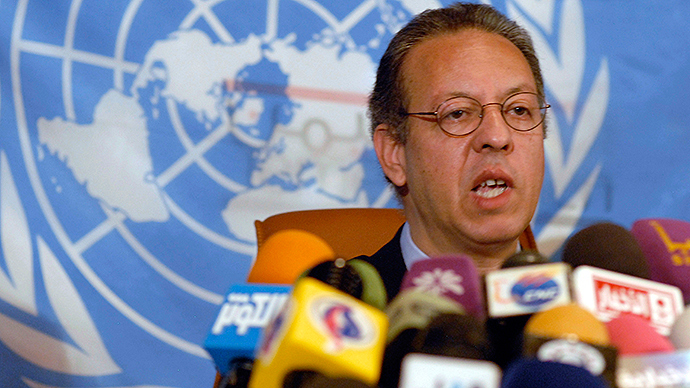 Benomar, a Moroccan diplomat who was tasked to facilitate power transition in the country in 2011 after the Arab Spring uprising, “has expressed an interest in moving on to another assignment,” the UN announced on Wednesday. It said his successor would be named soon. Reuters cites an anonymous UN official as saying that Mauritanian diplomat Ismail Ould Cheikh Ahmed will replace Benomar. The diplomat stepped down under pressure from some Middle East players, particularly Saudi Ararbia, who said his peacemaking effort was a failure. On March 26, the Saudis launched a bombing campaign against Yemeni Shia Houthi rebels, who allied with former Yemen president, Ali Abdullah Saleh, and took control of large swathes of the country. Saleh’s successor, Abd Rabbuh Mansur Hadi, who was elected for a two-year term in 2012, formally resigned in January only to withdraw his resignation after fleeing the Yemeni capital in February. He went to Saudi Arabia and requested its military assistance to fight against the Houthis. Saudi airstrikes and street battles between rebels and Hadi loyalists have killed at least 364 civilians, UN High Commissioner for Human Rights Zeid Raad al-Hussein announced this week. The bombings damaged or destroyed dozens of public buildings, including hospitals, schools, airports and mosques. Over 121,000 Yemenis have been internally displaced by the hostilities, according to the UN Office for the Coordination of Humanitarian Affairs. "Humanitarian partners are providing assistance, including water, sanitation and health services, but the response is constrained by continued high insecurity due to airstrikes and fighting on the ground," the office’s spokesman Jens Laerke said. Riyadh insists that its bombing campaign will continue, saying it has been rather successful. In the Yemeni capital of Sanaa protesters picketed the UN embassy, calling for an end to the Saudi bombings. The UN Security Council voted for an arms embargo against the Houthis, but failed to call for an end to the Saudi campaign. The hostilities in Yemen have damaged the already fragile economy of the poorest Arab country. Sanaa has been suffering from regular blackouts. The Yemeni natural gas company, a subsidiary of the French oil giant Total, shut down its operation in the oil-rich central Shabwa province this week.